Made by Edworthy, Silas in Guildford, New South Wales, 1932-1936. This miniature tandem bicycle is one of the most unusual bicycles produced by Sydney firm Edworthy Cycle & Motor Works. NSW State cycling champion Silas Edworthy built it, from metal tubing and re-spoked pram wheels, for monkeys to ride at Taronga Park Zoo between 1936 and 1940. It represents not just innovation in bicycle manufacture, but also an interesting episode in the history of leisure in Sydney and an exploitative attitude towards primates. The miniature bicycle is a scaled-down version of a tandem bicycle. It features standard metal bicycle tubing and full-size lugs to form the frame, which has been proportionally reduced in size. There is no headset, but a head pipe to which a straight handle bar is brazed; on the rear set, the straight handle bars are brazed to the saddle pipe. Regular saddle pipes have been cut down and the leather saddles, probably by Brooks, trimmed roughly to suit the monkeys. The crank wheels are cut from a flat steel plate to suit the cranks and 'rat trap' pedals. Reynolds chains have been used, but reduced in length. Both front and back wheels have been taken from a pram and re-spoked to take bicycle hubs. The rear wheel is larger than the front one. The tyres are solid rubber with a wire core. The bicycle has been repainted over the years. Logo at front of bike. Underneath an image of a wheel with wings a logo at the front of the bike reads; 'De Lux / Edworthy / Cycle & Motor Works / Leichhardt / Guildford / Lidcombe'. The history of the Edworthy family's Sydney cycling business goes back to Edward Edworthy, born c. 1858 in Newport, Monmouthshire, in Wales. He worked his passage to Australia as a marine engineer, arriving in Sydney in 1882. Six years later Edward joined the Engineers' Branch of the NSW Railways and worked as a fitter at the Eveleigh Railway Workshops. He was later posted to Lithgow in 1889, where he oversaw railway bridge construction. Edward stayed with the railways until 1895 and returned to Sydney the following year. He opened his first bicycle shop at 97 Western Road, Rozelle, thereby commencing the long history of the Edworthy Cycle & Motor Works in Sydney. This store was used until 1917. Edward left his two sons Jack and Silas to look after the bicycle shop in Rozelle and opened a dental surgery in Newtown. Silas Edworthy had been born in Lithgow in 1889. He was keenly interested in cycling and from about 1906 built bicycles and repaired motorcycles. He also competed in numerous cycling races and won a number of medals between 1909 and 1910. At the age of 21 Silas was the 1911 NSW State Road Racing champion. By 1917 Silas Edworthy had moved into another shop at 576 Parramatta Road, Petersham. The building remains today at the top of Taverners Hill. A large two storey corner building at 625-631 Parramatta Road, Leichhardt, was another store he used; it probably had an upstairs residence. Business was booming so, in the early 1920s, Silas opened yet another shop at 60-60a Joseph Street, Lidcombe, which was later managed by one of his sons, Lionel. This was advantageously located opposite the finish of the famous Goulburn to Sydney bicycle endurance race, which was undertaken by many famous riders including Sir Hubert Opperman (Oppy). In the 1930s Silas left another of his sons, Iver, to manage the Lidcombe shop and moved back to Leichhardt, where he had a pair of two-storey shops built, with residences behind, at 597-599 Parramatta Road, Leichhardt. Between 1932 and 1936 Silas built two miniature bicycles, a single and tandem, for the monkey circus at Taronga Park Zoo in Sydney. As with all his bicycles, the Edworthy monkey bicycles were hand-made. The frames were made from metal bicycle tubing by bronze welding using coal gas mixed with air from a set of foot-operated blacksmith's bellows. The frames were sprayed with enamel paint, and fancy scrollwork was added by hand. After the artwork was completed it was 'baked on'. An advertisement dated 22 March 1934 stated that Edworthy cycles were 'all hand finished, not built by machinery for quickness and cheapness. They are also hand filed, not dry blasted by machine, which will eat the tubing and lugs away. There is a difference between cycles built to order, like a machine made suit and one hand finished. So order your next cycle at Edworthy's and see it being built. We have been specializing in cycles for over thirty years. We do not get an old traded-in crock and put 'built by us' on the bar, as done by others close by'. The monkey bicycles were only a very small part of the Edworthy production. Many well-known riders of the 1920s and 30s, such as Frank Andrews, Bob Porter, Fred McMartin, Joe Phillips and Jack Hagney, rode to victory on Edworthy racing bicycles. The firm sponsored bicycle races, provided the prizes and organised social riding outings. In 1934 Silas built and patented a special bicycle frame which had two loops added, one in the cross bar and one in the down tube. He called this design the 'Spring Frame', the idea being that the loops dampened the shock of the rough dirt surfaces on long road races such as from Goulburn to Sydney. The company made children's bicycles and tricycles with cushion tyres, rubber grips and spring saddles. It also made delivery bicycles, and one built with a steel box carrier at the front was called the 'Edworthy slick delivery wagon.' A tricycle with a large carrier box between the two front wheels was marketed as the 'Edworthy Express Wagon'. The company also fitted pram and scooter tyres, and restored and repaired bicycles by brazing, nickel plating, enamelling, bar bending and wheel building. For the motorist, it reconditioned magnetos and batteries. The Edworthy firm was agent for numerous motorcycle firms including Harley Davidson, Indian, AJS, Sunbeam and BSA. It diversified further by hiring cars, motorcycles and bicycles, and even building and repairing trotting sulkies and invalids' chairs to order. This miniature bicycle was one of two made for the monkeys to ride at Sydney's Taronga Park Zoo monkey circus. The zoo was established in 1884 at Moore Park and was operated by the Zoological Society of NSW. In 1916 it moved across the Harbour to a magnificent 52-acre site with a special entrance building, seal ponds, elephant temple, monkey pits, aviaries and walking paths. The giraffe house was added in 1923, an aquarium in 1927 and a floral clock in 1928. The animal kindergarten opened in 1932 with monkeys Freda and Freddie, who rode miniature bicycles. This attraction must have been so popular that a special concrete monkey circus arena, 25 feet in circumference and capable of accommodating 1000 spectators, was opened near the northern entrance of the zoo on 1 November 1936 by Lord Hartington, Parliamentary Under-Secretary for the Dominions. It was planned to include trained monkeys, dogs and ponies. The monkeys raced on tiny bicycles and performed tricks. One of the most popular drawcards was Mabel, the monkey referred to in the press at the time as the 'Zoological Cycling Champion'. She rode up to 12 circuits of the arena depending on the reaction and enthusiastic applause from the audience. Two monkeys pedalling on a tandem bicycle were also very popular. As well as the Edworthy company, several other firms supplied bicycles for the monkey circus, including Malvern Star and Speedwell, made by Bennett and Wood Pty Ltd. The circus was seen to be a good form of advertising. These monkey bicycles were on loan to the Zoo and were returned to Silas Edworthy around 1940. They were then displayed in the windows of the Edworthy Lidcombe and Leichhardt cycle shops, together with an early bone shaker and an Edworthy-built ordinary (penny farthing) bicycle. The monkey bicycles were ridden from time to time by Silas's grandchildren, including Kenneth M. Edworthy and Ivan Edworthy. At the age of 5 or 6, Ivan was photographed riding the single monkey bike before a track cycling event at Lidcombe oval in 1940. 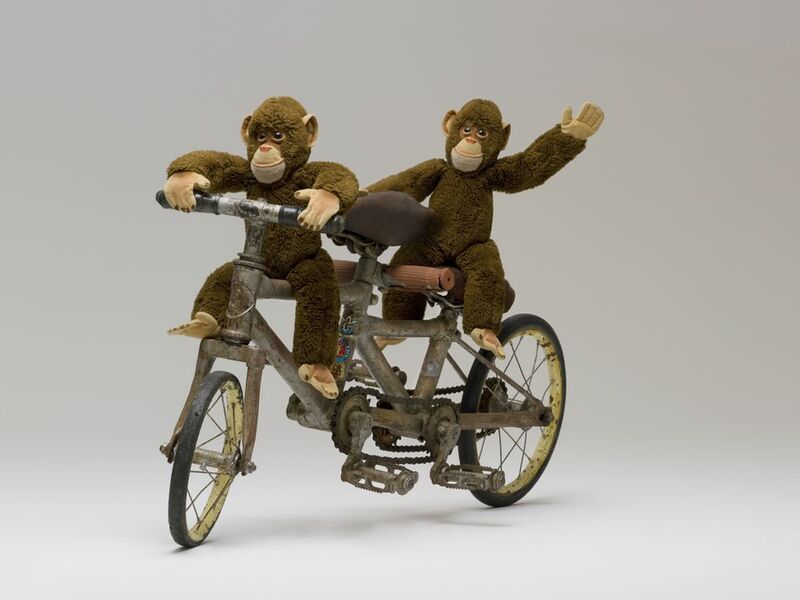 After the death of Silas Edworthy in 1963 the monkey bikes remained with one of his sons until acquired by bicycle collector Jack Warlaw, who displayed them at festivals, parades and fundraising events. During the 1990s he lent them to Taronga Zoo for an exhibition. After Jack's death in 1996 his collection of antique bicycles was auctioned, but his wife, Patty, returned the monkey bicycles to the Edworthy family. She knew how much they had meant to Silas's grandson, Ken Edworthy. "Caged Monkey in Audience; Lord Hartington Opens New Zoo Circus" in 'The Sun" 21 November 1936.